YUP! 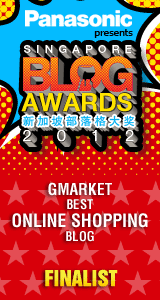 MANY thanks to all of you, I'd been nominated as the Top 10 finalist for OMY.sg Singapore Blog Awards 2012! LOL! *Off-topic* A picture of me and my Bro (Dylan) at Singapore Import Night. OK! Let's off to the questions thrown to me! SH: Being a marketing personnel in the beauty industry for more than 5 years and a freelance model/talent back then, I had the pleasure of having more leisure time exploring my interest - Beauty, Makeup & Skincare! Furthermore, my friends and relatives also frequently asked me about beauty questions so I was thinking "why not start up a blog where I can share all my beauty findings across the board for all?" Hence, this beauty blog was officially 'hatched' on April 2011! Hooray! EVERY VOTES MEANS ALOT TO ME.